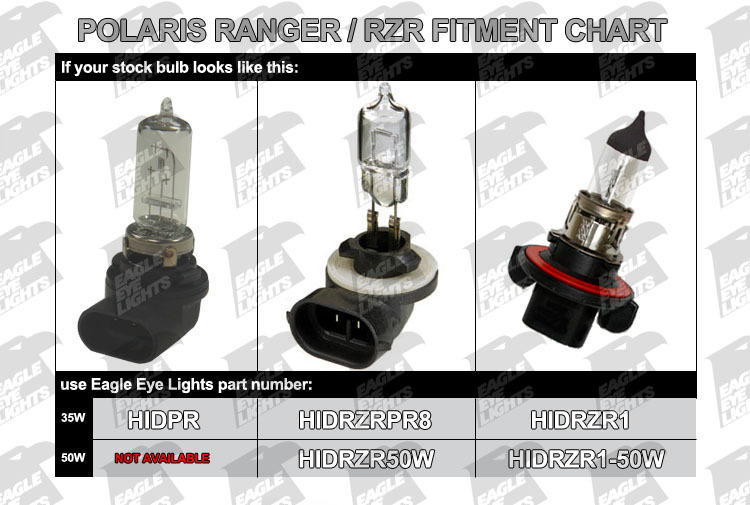 These Polaris Ranger HID conversion kits allow you to replace your dull factory headlights with ease because of TRUE PLUG-N-PLAY components made specifically to fit your machine. No splicing, cutting, gluing, modifying nor changing out headlight assemblies to make these kits work. Ready to install right out of the box and very user friendly! Do not be fooled by the cheaper kits you see listed on other sites. They require you to cut your factory wiring harness and modify your headlight assemblies, which is a BIG NO NO! MUD RIDERS, no worries, these kits are completely waterproof and are ready for your abuse! However, from our experience, we highly suggest that you run a bead of marine silicone around the area where the bulb attaches to the headlight assemlby to prevent leaking from pressure in deep mud & water. Please CLICK HERE for application guide. Also, see bulb chart below. These are single beam bulbs. If you have other aftermarket items on your machine, you may consider purchasing a 320HID Relay Harness to help regulate the power to the headlamp assembly.